The Split Region is an area of dramatic landscapes, fantastic beaches, and ancient history, great for relaxing or active holidays. Lounge on a pristine sandy beach, or go rafting over waterfalls. Climb up a rocky mountain, or stroll around a UNESCO World Heritage Roman palace. 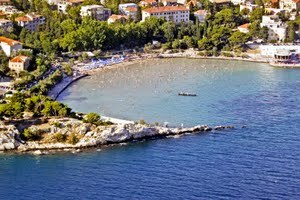 The Split Region has some of the best beaches in Croatia, both long and sandy or small and secluded. 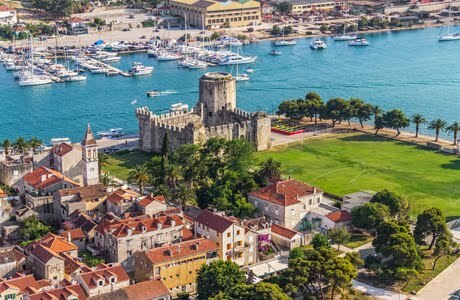 If you’re heading for the famous Dalmatian Islands, the Split Coast is definitely worth a stop on your way. The Split Region is great for a beach or active holiday, or as a stop on the way to the stunning Dalmatian Islands. There are some superb beaches in the area which are mainly sandy or pebbly, with lots of opportunities for swimming and water sports. You can also do adventure sports such as rafting and canyoning on the Cetina River in Omiš. For land-based activities, there are lots of places for walking, hiking and climbing. 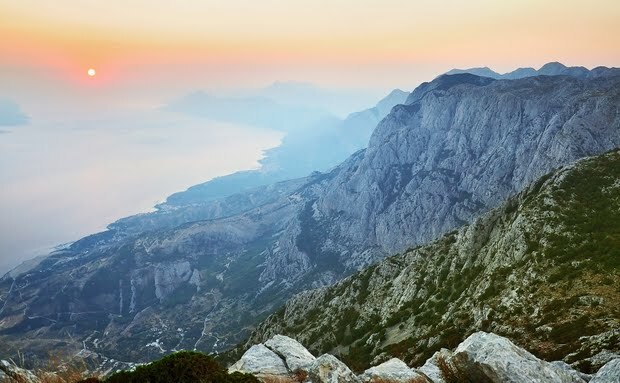 The best spot for this is the Biokovo Nature Park - a mountain range of towering peaks and interesting landscape on the Makarska Riviera. 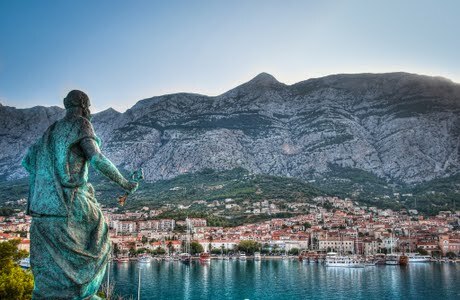 Split, Makarska Riviera, Trogir, Otok Ciovo Island and Omiš. Bacvice Beach (Blue Flag) in Split, Velika Beach and Punta Beach (Blue Flag) in Omiš, Baška Voda beach (Blue Flag) and Brela Beach on the Markarska Riviera, Okrug beach, Saldun beach and Mavarscica on Otok Ciovo Island. 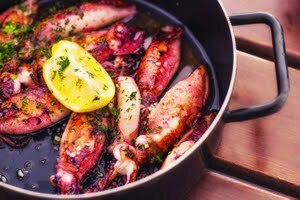 Typical of the Adriatic coastline, the Split Region has much to offer in the way of fresh seafood, and locally sourced traditional dishes. Split itself has a huge range of restaurants, konobas (local taverns), cafes and bars. 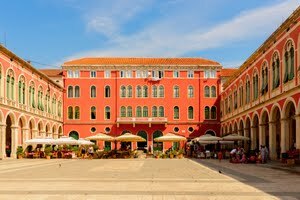 The smaller towns all have nice spots to get fresh Croatian cuisine and local specialities. 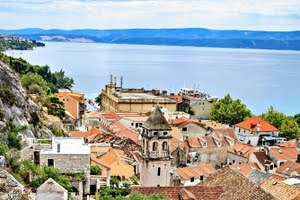 The Split Region has an intriguing history and some beautiful old buildings, including two UNESCO World Heritage Sites. 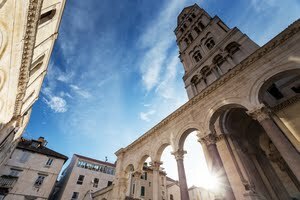 The area has been inhabited since Roman times and one of the most impressive Roman structures is Split’s Diocletian Palace, built in the 3rd century by Emperor Diocletian. It is one of the UNESCO sites, and is still in use to this day with bars, shops and restaurants in it. 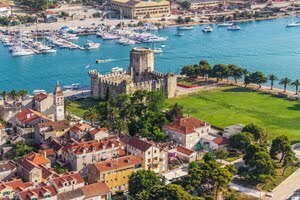 The whole town of Trogir is also a UNESCO site, because it is a medieval town built on the foundations of a Roman city, and the layout hasn’t changed for centuries. It has a 13th century palace and an impressive 15th century fortress. The quaint city of Omiš is a former pirate haven, and you can still see the 13th century Mirabela Peovica Fortress where pirates sheltered from enemy attacks. The Split Region has hot summers and mild winters. July is the warmest month in Split, with average highs of 30°C and average lows of 20°C. The coldest month is January with average highs of 11°C and average lows of 5°C. It has an average of 109 rainy days per year, with November and December the rainiest months. It is a very sunny area, and in summer there are 10 to 12 hours of sunshine most days. As the Split Region is great for outdoor and water activities, the best time to visit is between May and October. Split has the second largest international airport in Croatia, with regular flights to and from the UK.